PARIS — L’Heure Asch, a discreet watch boutique nestled in the cobbled streets of Old Geneva since 2001, quickly became one of the world’s most important shopping destinations for aficionados of independent brands. Clients would fly in from around the world to see what Denis Asch had in store. Today, however, Mr. Asch is the one doing the traveling for his clients. Last year, in search of unique pieces, Mr. Asch flew to Singapore to buy a collection of watches, including a Richard Mille, which he then sold to collectors in Switzerland. The watches never appeared on the shelves at L’Heure Asch: They went straight to the buyers. This new approach came to Mr. Asch when he looked at the booming art market, with which the market in collectible watches shares several similarities. “There are more and more art collectors, like there are more and more watch collectors,” he said. Mr. Asch set out to meet with art collectors, who told him how much they relied on professional advisers to seek out unique works, drawing on their knowledge of art but also their knowledge of the art world and its established networks of galleries and collectors. Mr. Asch said he saw an opportunity to offer the same service for watch collectors, monetizing the networks that he had developed over the past decade for L’Heure Asch. “It’s more a natural evolution than a revolution,” said Mr. Asch about his new way of working. Clients now buy his expertise rather than his watches. The self-described “investment banker of luxury watches” uses his store primarily as a meeting room and launching pad for future deals: When he is away on his travels, the premises stay closed. 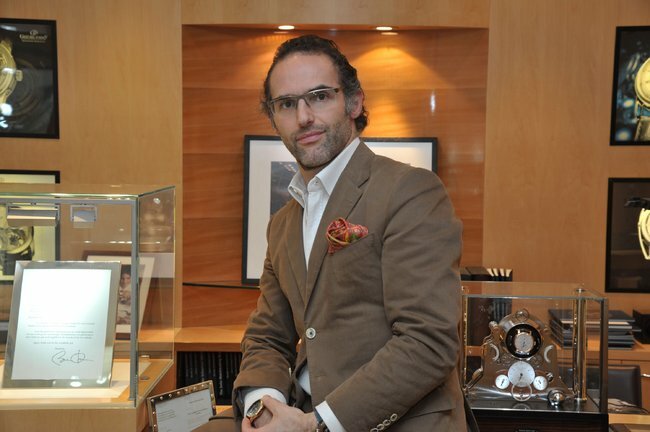 His main destination, he said, is Asia, where the growth in sales of Swiss watches has been paralleled by a rising number of new collectors, curious and excited by the idea of moving on from the big-name luxury brands to invest in pieces by the more esoteric independent watchmakers with whom Mr. Asch has been working for years. Having been used to a specific European clientele, Mr. Asch says the fresh faces offer a new challenge. Their taste for extravagant designs was foreign to Mr. Asch, who had so far dealt with Europeans. Another region turning toward Mr. Asch is the Middle East. This time, clients come with a pre-established tradition of collecting rare timekeepers. Mr. Asch estimates that 20 of his 600 clients are Middle Eastern. Despite his business relationship with the Middle East, Mr. Asch has been there only once, to Dubai. Instead, he meets with clients during their business trips, in Europe, or during international watch fairs. Their tastes are “extravagant” and they are “proud to spend,” he said; but beneath the surface ostentation his Middle Eastern clients are deeply knowledgeable about mechanical watches. “They’re looking for rare watches. They’re not looking at known brands, but independents such as Greubel Forsey,” said Mr. Asch, who used to count Greubel and Richard Mille among his independent watchmaking suppliers, but no longer does so now that the shop is mostly closed. Still, their extravagance also has its charm, Mr. Asch said, and they are among the most generous people he has met. He tells a story of being, on one occasion, in a Geneva restaurant, enjoying dinner with a large group of friends, and spotting one of his Middle Eastern clients through the window. The client did not interrupt the meal to say hello, but when Mr. Asch later asked for a rather impressive eight-person bill, he was told that someone had come inside to take care of it. Another client, whom he met in Paris recently, invited him to stay at his apartment in Dubai. In that case, Mr. Asch acknowledges, he was tempted to accept the offer: How else was he to install the two Erwin Sattler clocks that the client had just purchased? According to Mr. Asch, watch retailers like him fared well during the global economic crisis. But between the Internet and the trend for the big brands to sell through their own flagship stores, the retailing world is being challenged, and the way that watches are bought and sold is changing. Clients are expressing new demands and expecting a new level of service, and those who do not adapt risk losing out, he said. “More than ever, you can’t hesitate to get out of the store if you want to stay in business,” Mr. Asch said.